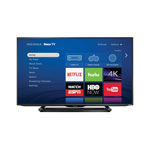 "LED 4K Ultra HD Insignia Roku TV (NS-50DR710NA17): $499.99.55"
LOS GATOS, Calif.--(BUSINESS WIRE)--Roku, Inc. today announced that the first 4K UHD Insignia Roku TV models are available for purchase exclusively from BestBuy.com starting today and will be available in Best Buy stores nationwide early next month. As with all Roku TV™ models, the 4K UHD Insignia Roku TVs feature the award-winning Roku® operating system (Roku OS) that provides a simple smart TV experience with a personalized home screen and access to more than 3,000 streaming channels in the US, including 10+ streaming channels that offer 4K UHD content. The new 4K UHD Insignia Roku TVs have a sleek bezel design and include features unique to the Roku platform that are specifically designed to enhance the 4K UHD viewing experience, including Roku’s 4K Spotlight Channel and a 4K UHD category within the Roku Channel Store. The 4K UHD Insignia Roku TV models are available in 43”, 50” and 55” screen sizes and are equipped with a powerful quad-core processor and fast 802.11ac dual-band Wi-Fi to ensure a smooth 4K UHD streaming experience. 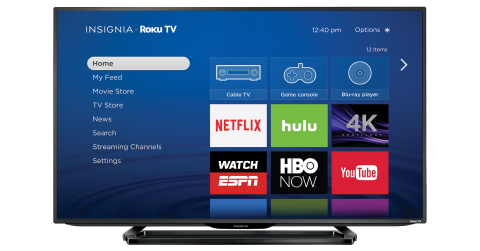 The 4K UHD Insignia Roku TV models comply with the Consumer Technology Association (CTA) certification requirements to bear CTA’s 4K Ultra HD Connected logo. The 4K UHD Insignia Roku TV models combine 4K resolution with features designed to help consumers quickly find and watch movies, TV shows and videos. The 4K Spotlight Channel provides instant access to a curated selection of 4K entertainment from a variety of streaming services in one place, helping consumers discover 4K content in a few clicks of the remote. In addition, a 4K UHD category that currently includes more than 10 streaming video services such as Netflix, PLEX, YouTube, UltraFlix and more is available within the Roku Channel Store to make it simple for consumers to add streaming services with 4K entertainment. Consumers will have access to additional services offering 4K movies, TV shows and videos as they become available on the Roku platform in the future. Roku TV features an easy to navigate, customizable home screen that places streaming channels alongside consumers’ other TV entertainment choices, such as a game console, cable box or Blu-ray player. Unlike other smart TVs, consumers don’t have to cycle through inputs or navigate menus to access their entertainment. With Roku TV, they can watch a live sports event, stream their favorite show or stream their favorite music all from their home screen. Roku TV provides access to the Roku Channel Store, which includes more than 3,000 available streaming channels in the US with 300,000+ movies and TV episodes plus sports, music, news, fitness, and much more. Roku’s comprehensive and unbiased universal search feature helps consumers find availability and pricing for movies and TV shows across more than 25 top streaming channels. Search results are ordered with the least expensive (or free) results listed first. Roku TV also features the Roku Feed which enables consumers to follow entertainment they’re interested in and be notified when it becomes available to stream — and at what price. The new 4K UHD Insignia Roku TVs can be controlled with the simple and intuitive remote control or through the free Roku Mobile App for iOS and Android. Consumers can use the Roku Mobile App to quickly access features such as the Roku Feed, Play On Roku — to share personal video, photos and music, directly from a mobile device to the Roku TV — and voice search. In addition, consumers can cast video from the Netflix and YouTube mobile apps to the TV. 43" LED 4K Ultra HD Insignia Roku TV (NS-43DR710NA17): $399.99. 50" LED 4K Ultra HD Insignia Roku TV (NS-50DR710NA17): $499.99. 55" LED 4K Ultra HD Insignia Roku TV (NS-55DR710NA17): $649.99. The 4K UHD Insignia Roku TVs are also available in 43” and 50” sizes at Best Buy stores in Canada and on BestBuy.ca. Visit BestBuy.ca for more information and pricing. Roku is the creator of a popular streaming platform for delivering entertainment to the TV. Roku streaming players and the Roku Streaming Stick® are made by Roku and sold through major retailers in the U.S., Canada, the U.K., the Republic of Ireland, France and Mexico. Roku licenses a reference design and operating system to TV manufacturers to create co-branded Roku TV models. Under the Roku Powered™ program, Roku licenses its streaming platform to Pay TV providers around the world who want to use the Internet to deliver entertainment services through streaming players. Roku was founded by Anthony Wood, inventor of the DVR. Roku is privately held and headquartered in Los Gatos, Calif., U.S.